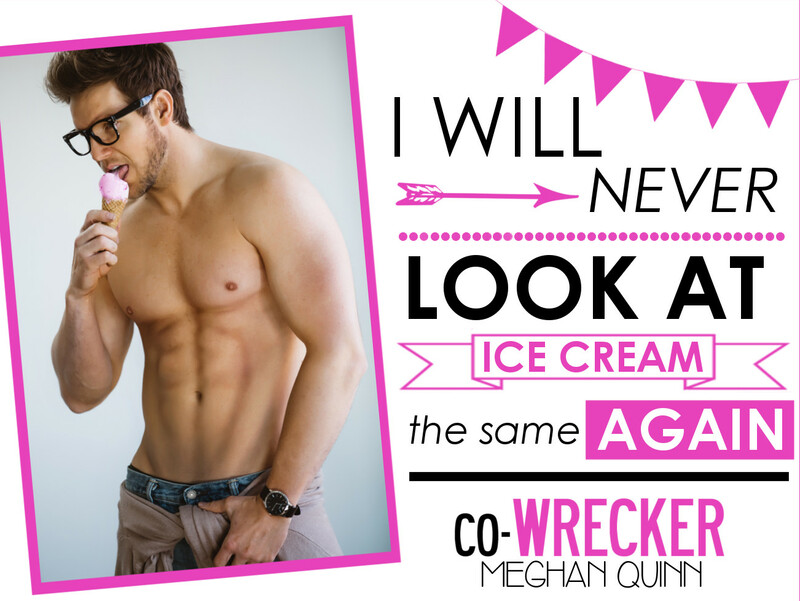 Co-WRECKER by Meghan Quinn – here is an excerpt!!! What do ice cream and Sadie Montgomery have in common? They’re both ice cold, but one taste is never enough. I wanted to be friends — I would have even settled for her seeing me as anything but a nerd — but there was no getting through. So just like any hard-headed, red-blooded man out there, I made up my mind. I’d make my coworker fall for me. I’d like to say it was simple, but like every other epic love story, all it took was one drunken night and a lot of naked courage to get the girl. For a moment, at least. Love with a coworker is never simple, especially since Sadie’s trying to keep us on the low. Not to mention her persistent ex-boyfriend who won’t leave her alone. But I’ve never been good at giving up, and I don’t plan to start now. The whole thing is a recipe for a rocky road, but I plan to eat the whole gallon, no matter how bad the brain freeze. For a guy who doesn’t have any of his nighttime items, he’s taking quite a long time in there. Sitting cross-legged on my bed, I wonder what he could possibly be doing. Oh God, did he pass out on the toilet? Willy out? What’s a girl to do if that’s the case? Do I tuck it back into his pants and push him to the side? No one wants to tuck a flaccid wiener back into underpants, especially foreign flaccid wieners. Chewing on my lip, wondering if I should go knock on the door, I bounce my foot up and down. I need to pee. If he’s passed out on the toilet, I might just have to knock him to the side because I’m not going to be able to hold this all night, nor am I one to go squat it out in the bushes. Smilly, now she just might conduct such a pee with nature, but not me. I need porcelain to sit on. “Oh come on,” I mutter, now standing from my bed and heading to the bathroom where I pace in front of the door. Leaning my head closer, I hear water running so that has to be a good sign. Then the unmistakable sound of someone spitting into the sink. Is he . . . brushing his teeth? I’m about to knock on the door when Andrew opens it, shirtless, pants-less, wearing nothing but his glasses and black boxer briefs. He’s wiping his mouth with the hand towel that rests next to the sink when he makes eye contact with me. That damn smile greets me but it’s not what holds my attention. Oh. No. My eyes go for a wander down his body. I take in the very cut man, with beautiful muscles flexing under the dim light of my bathroom. Andrew, champion forearms, Mr. Sunshine, dork with the hot glasses, boy who won’t quite leave me alone at work, he’s . . . oh God, he’s everything under his clothes. Review: Crazy Over You by Daisy Prescott!